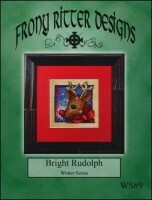 Frony Ritter has designs for every season, many of which have a Celtic flair, but what they all have in common are bright, cherry colors and a smaller size. Most of her designs are stitched twice, once with floss on fabric and also on perforated paper with floss and Mill Hill beads. She likes to use small pieces of fabric or perforated paper to make mini designs. She has two booklets of Minis, covering all four seasons, and her most recent chart has four mini bee patterns. Frony Ritter also puts out a new snowflake design and a new Easter egg design annually, so stitchers can build their collection every year.